Pharmaceuticals represent a high-value inventory where security can be a challenge. Controlled substances require secure storage solutions regulated by the DEA in the States (for Schedule 1 to 4 drugs) and by the Controlled Drugs and Substances Act in Canada (for Level 1 to level 11 pharmaceuticals). In general, Class III, IV and V controlled substances must be stored in a wire-cage environment. At International Vault, we provide a flexible array of cages featuring self-closing and self-locking doors, walls constructed of No. 10 steel fabric, and standard and custom lock options. Class I and II drugs require a solid-walled vault with limited access. Regulations allow for layered use of vaults and cages to accommodate business flow processes, for example where it is necessary to both store outgoing product and secure returned or rejected shipments. In some cases, both finished goods and bulk materials are designated as controlled substances, challenging manufacturers to design and maintain facilities that are both commercially viable and meet strict regulatory requirements. DEA requirements, for example, specify walls, floors, and ceilings able to withstand all but the most determined break-through attempts. That means 8 inches of steel reinforced concrete, self-closing and self-locking “day-gates,” and a vault door able to withstand 20-man hours of lock manipulation attempts. Where controlled substances are stored, entrances and exits must be locked and monitored continually. To meet these requirements, you need an experienced vault solutions provider like International Vault, where our three decades of vault design and security experience guarantee an exceptional solution. 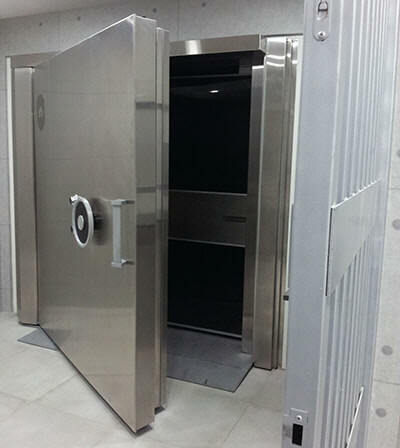 We can design and install a pharmaceutical vault solution that is viable for your unique facility and gives you the confidence of meeting all DEA and Health Canada requirements. Getting started is easy. Call 866-289-3698 to speak with one of our vault design engineers, or visit our Contact Us page. At International Vault, we believe modular vault systems offer the most flexible and cost-effective solution for any pharmaceutical storage and distribution challenge. We can, for example, design a vault for Class I and II controlled substances within a larger cage where Class III, IV and V drugs are stored. Your facility saves money by sharing utilities and security systems in the same area. Modularity guarantees the ability to handle capacity changes as your business grows, storage challenges as new drugs are approved, and new floor space configurations as your distribution and work process flows change. Cages and vaults can be added to, reconfigured, or reduced as needed over time. At International Vault, our modular vault solutions include vault doors and panels meeting GSA certification and UL standards. Founded in 1982, our company manufactures, delivers, and installs best of class Modular Vault Systems for a variety of industries, including a strong focus on vault storage solutions for controlled substances. A comprehensive understanding of Health Canada and DEA pharmaceutical regulations. Modular vault components that can be customized to meet your specific needs securely and affordably. 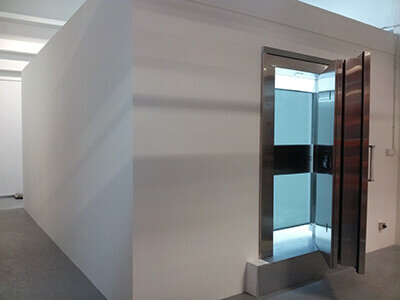 Vault doors designed for the highest level of asset protection, meeting UL and GSA certifications. The confidence of working with a vault manufacturer experienced in pharmaceutical vault solutions. Onsite installation by our dedicated teams provides a fast and exceptionally secure result. It’s our privilege to protect your most valuable assets. Call 866-289-3698, or visit our Contact Us page. One trend we see is building high when it comes to wire caging. 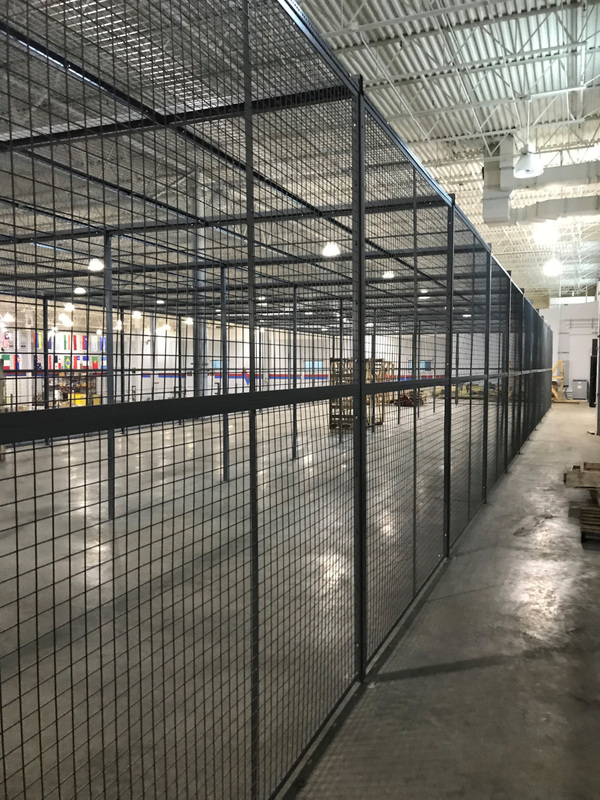 Tall cages, 15 feet and more, are becoming common in warehousing facilities, even to the point of customizing the wire “ceiling” with cut-outs to account for overhead structural and HVAC components. We work with you to design and accommodate any rack configuration, allowing ease of access to forklifts accessing materials stored 6 or more levels above the warehouse floor. Doors and gates must be designed with pallet jack and forklift traffic in mind. Our value is in the expertise and white-glove service we provide, taking you from a security challenge to a secured environment that gives you the confidence to store high value, regulated pharamceuticals. Rather than list an array of storage products and their benefits, at International Vault we partner with our clients to understand their unique, local situation and specific security challenges. Modular components allow us to construct a vault within your facility, using the available space as effectively as possible. In addition to the vault, we can design caging and day-gates to provide layered security barriers appropriate to situations where a facility stores drugs across a range of government regulated schedules and levels, each with varying security requirements. We also have narcotics safes for space saving, small quantity storage of controlled substances. Whatever your needs, we can help you determine the customized solution best for your situation and budget while assuring compliance with those regulations pertinent to your storage needs. It all starts with a call to 866-289-3698 or an inquiry posted to our Contact form. Our knowledgeable customer service representatives will begin the process of designing the perfect modular vault solution for your facility.